Die grundlegende Überblicksdarstellung für alle anglistischen Studiengänge. Das Miteinander von traditionellen und innovativen Bestandteilen anglistischer Lehre macht diese Literaturgeschichte interessant - als kursbegleitendes Studienbuch wie als Anreiz zum 'entdeckenlassenden Lesen'. Die systematisch an einzelnen Gattungen orientierte Kapitelgliederung ermöglicht neben dem Standard-Ansatz einer chronologischen Lektüre auch gattungshistorische Längsschnitte. 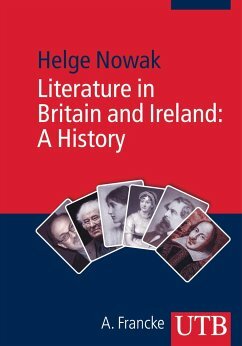 Literature in Britain and Ireland is a survey of literature on the British Isles since the time of the Anglo-Saxons. Despite this wide angle, the linguistic, regional and ethnic differentiations in each particular period are being emphasised. Because of its combination of traditional and innovative components of English Studies, this history of literature is useful as a study book accompanying courses as well as an incentive for discoveries while reading. The chapters are systematically structured to allow profiles along the history of genres. In addition to poetry, drama, short stories and the novel, different forms of non-fictional prose are being highlighted, too. Innovative tendencies in teaching English literature are taken into account beyond the consideration of popular and contemporary literature.Literature in Britain and Ireland is a survey of literature on the British Isles since the time of the Anglo-Saxons. Despite this wide angle, the linguistic, regional and ethnic differentiations in each particular period are being emphasised. Because of its combination of traditional and innovative components of English Studies, this history of literature is useful as a study book accompanying courses as well as an incentive for discoveries while reading. The chapters are systematically structured to allow profiles along the history of genres. In addition to poetry, drama, short stories and the novel, different forms of non-fictional prose are being highlighted, too. Innovative tendencies in teaching English literature are taken into account beyond the consideration of popular and contemporary literature. Prof. Dr. Helge Nowak lehrt an der LMU München.